A Wetland of international Importance, the Oak Hammock Marsh’s total Wildlife Management Area is 36 sq km. This restored prairie marsh is home to many species of birds, mammals, fish, reptiles, insects and more. What to Do at Oak Hammock Marsh? Explore this amazing diversity of wetland with are 30 kms of trails crisscrossing the marsh. Explore daily activities at the marsh that include seasonal guided walks, learning about marsh creatures, paddle on voyageur canoes, explore the winter marsh for animal tracks and join an interpreter on nature surveys. The Oak Hammock Marsh Interpretive Centre has many interactive exhibits that explore various topics: Fascination Station featuring underwater creatures at the marsh, Nature Nook featuring birds that make their home in the marsh, learn about wetland animals in Live animals, while different exhibits are featured at the Feature Hall. The interpretive also conducts many activities and programs including indoor and outdoor programs for all ages and abilities, through out the year which is guaranteed to bring you back every season. In addition, the Centre offers camps for kids of all ages – Spectacular Spring, Sizzling Summer and Wonderful Winter. The interpretive centre also features a theatre, meeting rooms, and observation decks. A Bird in the Hand: A Canadian Signature Experience that’s all about avian visitors. Learn about fall migration and learn the importance of the Oak Hammock Marsh in this seasonal movement of birds. Learn about bird banding in Canada as you experience first hand the thrill of holding a live bird in your hand. Know how bird banding is important in understanding bird populations as well as research and management projects. Not only is this an incredible experience for the bird lover, but as you band and later release the bird in to the wild, you also have a greater appreciation and understanding of the importance of wetland ecosystems for wildlife. 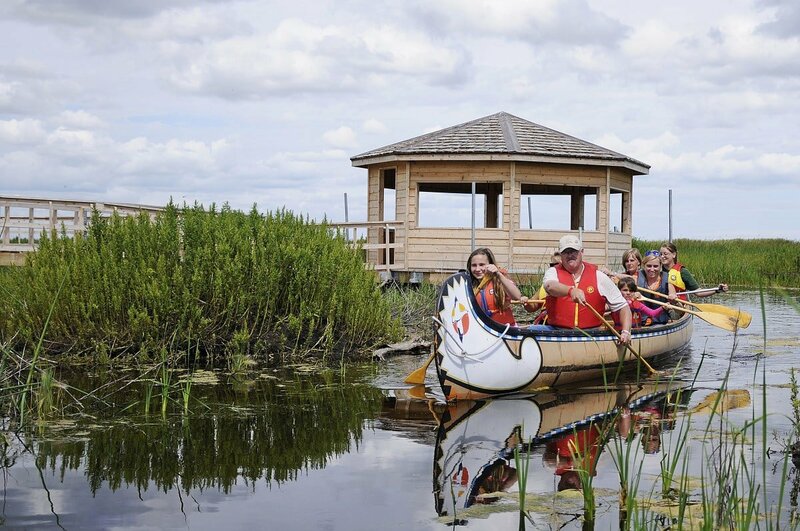 Later go on an iconic Voyageur canoe tour along the wetland. This gives you a closer look at the marsh inhabitants. Go on a guided birding walk along the trails and see blooming wildflowers. During winter, get a closer look at animal tracks. The Oak Hammock Marsh Interpretive Centre can be a perfect place to host birthday parties, private or corporate events. When to visit Oak Hammock Marsh? Oak Hammock Marsh Interpretive Centre is closed January 1, November 11, December 24, 25. Best time to visit: The highest concentration of birds can be see duriing Fall migration months- September and October. For nature walks, canoe rides and critter dipping, visit in June-August. Winter is the best time to identify animal tracks, explore the night sky. How much will it cost to visit Oak Hammock Marsh? How to get to Oak Hammock Marsh? Located only 20 kilometers North of Winnipeg (20-minute drive from the north Winnipeg or 45 minutes from downtown), on highway 67, between the town of Stonewall and the city of Selkirk. What about amenities and accessibility? Oak Hammock Café is open daily from 10 AM to 4 PM. Offers breakfast and lunch.